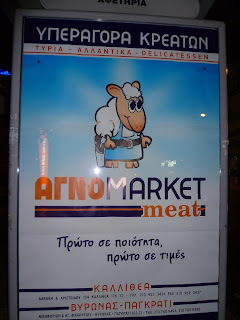 Adorably wandering the aisles of an Athens supermarket (uperagora) comes the little woolly lamb. In his adorable overalls he comes. With his adorable toolbelt he comes. Adorably, he is employed by the market. To provide whatever the customers require. Directions to the olives? Yes, yes, of course. Wet spill by the fresh-made baklava? Certainly. The men's toilet out of order? He'll get right to work on it. He is the adorable epitome of service. He exists only to give. And at the end of his shift, he'll give his last. 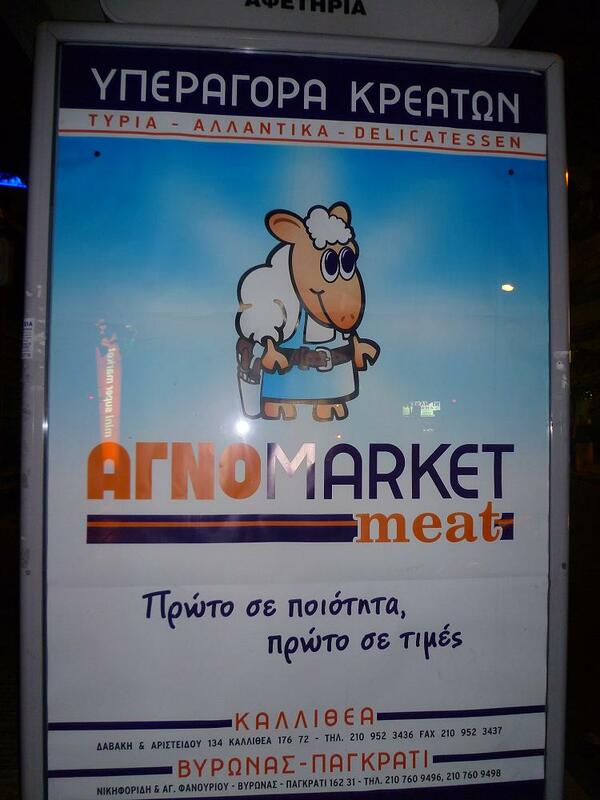 Whether in the form of souvlaki or kleftiko, or any of the multitude of dishes with which the Greeks pay him tribute—the market is even named after him and his flesh!—he will at last, adorably wide-eyed, surrender.